Barney the friendly plum coloured dinosaur is a particular favourite of toddlers and younger children. The television programme Barney and Friends is watched by youngsters all around the world. Barney also makes a great theme for a toddler's party. 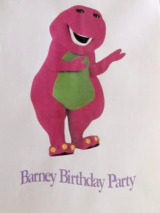 But 3 and 4 year olds will love a Barney Birthday Party too! These really do have to have a picture of Barney himself on them. You can buy lots of Barney merchandise online including invitations but it is fun to make your own. Home-made invitations are great and are a way of squeezing an extra bit of fun out of a Barney Party. If you wanted you can find a picture of Barney on the internet to download and incorporate into a cute design for your toddlers party. Computer programs are so easy these days and with a bit of electronic cut and pasting it is easy to come up with really neat personalised designs. You may for instance like to have a picture of your child with Barney on the invitation. A more art and crafty option is to make a template of Barney and use it to prepare some blank pictures of the friendly dinosaur. Then you and your child get busy with the crayons and colour them in. Stick a little card or address sticker with the party details on the back. Barney is a purpley-plum colour with a green tummy so green and plum /purple should definitively be the colours for your party. Decorate your venue with purple and green balloons and streamers. Download and print (or buy) plenty of pictures of Barney and his friends and have these up on the walls - don't forget to put them at toddler height! Another popular decoration is big purple dinosaur footprints printed on to card and stuck around the floors and walls. There is no point tying yourself in knots trying to come up with elaborate Barney party games. Toddlers and younger kids much prefer very simple party fun anyway. Fortunately many simple toddler birthday party games can be easily adapted and given a Barney Party twist. While your guests are arriving have a few simple blank pictures of Barney and his friends available to be coloured in. It is also a useful thing to have about should a child prefer to sit out a particular game. Make a Barney Headband - Headbands are always better than masks for younger children. Simply have the shapes of Barney and his friends cut out and ready to be stuck on to headbands made of thin card. This is a simple Barney Party activity. In advance prepare some dinosaur cookies. You can buy specific Barney cookie cutters but, to be honest, any dinosaur shape is fine. For toddlers however they should be nice and big. Place the blank cookies on paper plates and have some purple icing ready. Either use commercial or make your own from icing sugar, warm water and purple food dye. Let your kids "carefully" ice their cookies. Add silver balls or sweets for eyes. Write the child's name on each plate so they can take home their cookie at the end. This is very simple but a great way to start your Barney Birthday Party. Pin up one picture of each character at child height (or stick to the floor) in the four corners of your room. You then show which character is in each corner by pointing to the picture and asking "Who's this?" etc. Then you stand in the middle and hold up one of the spare pictures. " Everyone run to ….."
All the children must run to the appropriate corner. Then you hold up another picture ie Riff " Everyone run to Riff"
This carries on with a different character each time. Repeat as many times as you like. That is all there is to it. Simple. Please do not think that this game is too easy. Toddlers and even slightly older kids really like simple party games that they understand. They love the rush to the next picture each time - even better if Mum is rushing there too. We promise this game is a real winner! Can you put Barney back together? Download and print some pictures of Barney and his friends. You may like to print each character on a different coloured card. Cut each picture into 4 simple pieces. All the children must stand at one end of the room facing the wall - no peeking! Hide the picture pieces (not too carefully!) around the room. The children then all have to rush and find the bits of picture and bring them back to the middle where they must be put back together. A big cheer for everyone when they are all done. Barney and his friends love parades. There is nothing better than marching along together. Get your children either in a big circle marching around or marching together from one end of the room to the other. Play some suitable marching music . You could even give out streamers, flags and blowers. The children march up and down but when the music stops must freeze still in mid-step. Milk the moment and wander up and down seeing if you can detect any wobblers. Best to play it just for fun however no need for anyone to be out. Repeat as many times as you like. This is a simple game of Musical Bumps given a Barney makeover. While music plays the children dance around possibly doing the Barney Boogie or Dinosaur Stomp (come on Mum time for a demonstration!). But when the music stops everyone must drop to the floor. No-ones out in this game instead the first person down wins a small sweet. Then its everyone stand up to do it again. Continue until everyone has won a sweet (isn't it amazing how a different child seems to be first each time!!). This is a simple variation on pin the tail on the donkey. In turn each child is blindfolded and given a heart shaped sticker (available from craft shops). They have to put their stickers where they think Barney's heart is. The nearest to the right place wins. Variation - You could also have stickers of cookies ( store bought or you can easily make your own by cut and pasting downloaded pictures into envelope address labels) that you have to stick in or as near as possible to Barney's mouth. Tip: Some children dislike being blindfolded. Mum's hands over the eyes is cool. What Barney treasure will you find? This is popular with children and there are a number of ways you can do it. You need a number of little items for the children to find. These could be small Barney toys or little plastic dinosaurs. Or you may like to wrap small gifts and use them as your barney party favours to be found at the end of the party . You then need to make a Bran Tub. This can be a large bucket, dustbin, baby's bath or a good sized cardboard box. Decorate it appropriately in plum and green colours. Simply adding some balloons and ribbons can make it extra special. Stick a large picture of Barney on or near it. Fill your tub either with shredded paper or those small polystyrene packaging noodles and hide your prizes in it. The children then come and rummage in turn to find a prize. Big cheers when they are "clever" enough to find one!